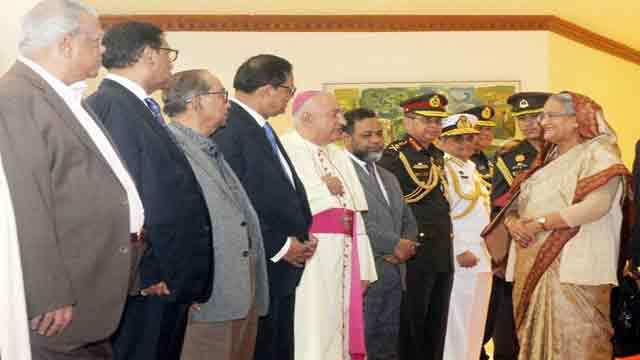 Dhaka, Dec 11 (Just News): Prime minister Sheikh Hasina left Dhaka for Paris on Monday morning on a three-day official visit to attend ‘One Planet Summit’. An Emirates flight carrying the prime minister and her entourage left Hazrat Shahjalal International Airport at 10:20am. During her visit, the prime minister will hold a meeting with French president Emmanuel Macron. French president Macron, World Bank group president Jim Yong Kimand, UN secretary-general Antonio Guterres will address the ecological emergency for planet by calling together in Paris international leaders and committed citizens from around the world. A main focus of this event will be on determining how those working in public and private finance can innovate to support and accelerate common efforts to fight climate change. The prime minister is scheduled to reach Charles De Gaulle International Airport in Paris at 7:30 pm (local time) on Monday. Bangladesh ambassador to France Kazi Imtiaz Hossain will receive the Prime Minister at the airport. From the airport, Sheikh Hasina in a ceremonial motorcade will be taken to Intercontinental Paris Le Grand (Opera) where she will be staying during the visit. At the conference, the prime minister and other global leaders will discuss seven specific issues, including carbon neutral alliance, alliance on boycotting coal, climate funding, said the foreign minister. He hoped that the global leaders will make new commitments during the conference on climate issues. The prime minister will hold a bilateral meeting with French President on Tuesday morning which will help strengthen the relations and expand the areas of cooperation between the two countries. Hasina visited France in 1999 and 2011. She will also join lunch to be hosted by French President for the heads of state and government, co-organisers and VIPs of the Summit at Elysee Palace. On Tuesday evening, the prime minister will attend the High Level Segment of the One Planet Summit at La Seine Musicale. After returning from the Summit, the PM will join a community event at her place of residence. The prime minister is scheduled to return home on 14 December.